The Regional and State Employment and Unemployment Report, released today by the Bureau of Labor Statistics, was generally positive—a nice reversal from the more negative tenor of the last few state jobs reports that suggests the slowdown in job growth in April and May might have only been temporary. Over the past 3 months, a majority of states have added jobs, and state unemployment rates have mostly held steady or declined. Most states where the unemployment rate rose substantially also saw growth in their labor force, giving hope that at least some of the increase in unemployment could be from discouraged job-seekers restarting their search. From March to June, 35 states and the District of Columbia added jobs, with Florida (+0.9 percent), California (+0.8 percent), Delaware (+0.7 percent), Massachusetts (+0.7 percent), and South Dakota (+0.7 percent) posting the largest percentage gains. The regional diversity of these states is instructive: job growth was fairly widespread throughout the country with every Census region showing gains, except in the East South Central region (Kentucky, Tennessee, Alabama, and Mississippi) where the job total declined slightly. 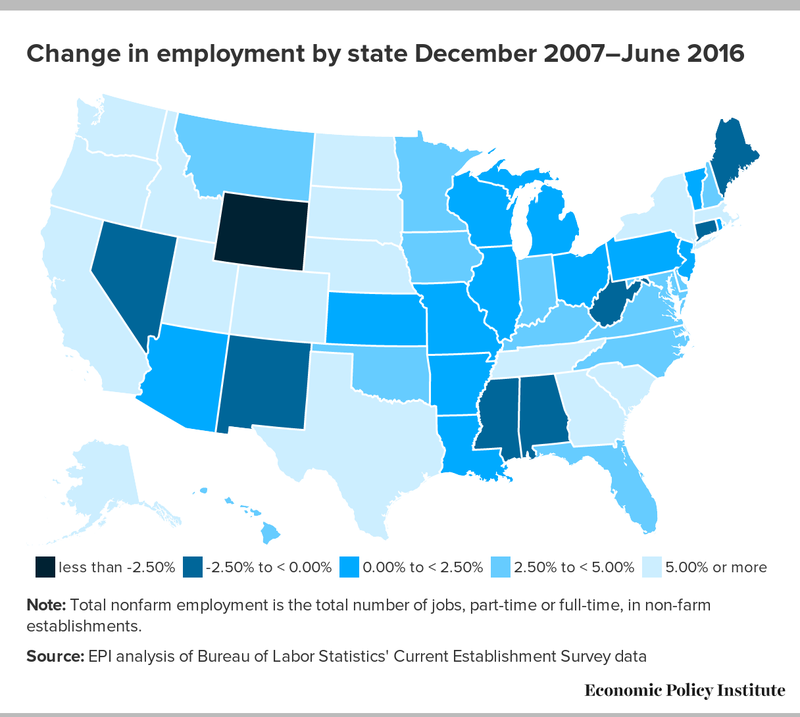 Of the 15 states where job numbers did decline since March, only Wyoming (-1.4 percent), Mississippi (-0.9 percent), North Dakota (-0.4 percent), and Rhode Island (-0.4 percent) had sizable reductions. From March to June, unemployment fell in 24 states and the District of Columbia. Kentucky (-0.6 percentage points), North Carolina (-0.6 percentage points), West Virginia (-0.5 percentage points), and the District of Columbia had the largest reductions in unemployment. 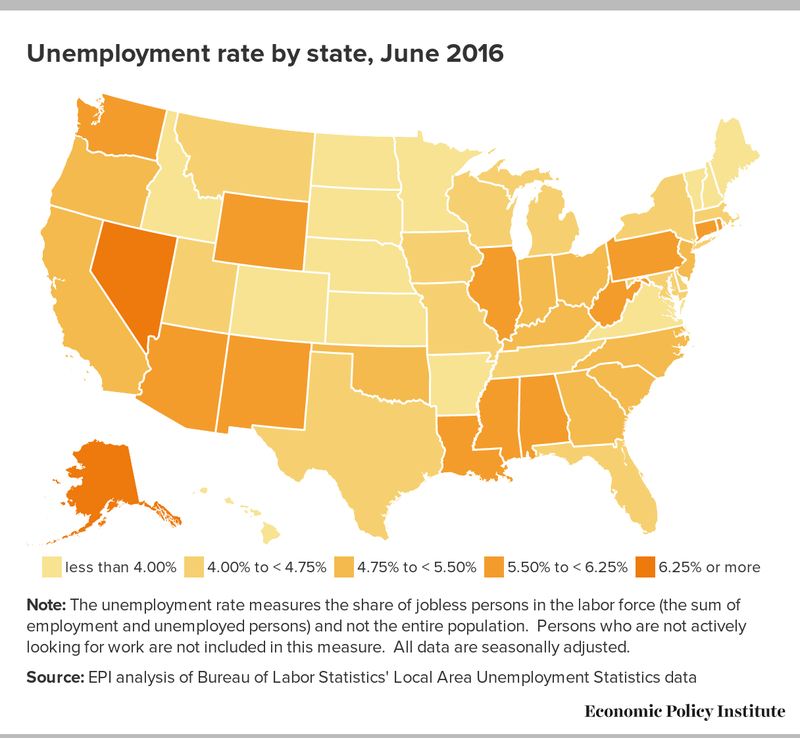 The unemployment rate rose in 21 states, with the biggest jumps occurring in Colorado (+0.8 percentage points), New Jersey (+0.7 percentage points), Pennsylvania (+0.7 percentage points), and Nevada (+0.6 percentage points). Of these four, the labor force expanded in all but New Jersey. While the June state jobs report provides reason for optimism, it should not be viewed as a sign that the current job market is as good as it gets. The prime-age employment-to-population ratio is still below the lowest level reached in the previous two recessions prior to the Great Recession. Nominal wage growth is still far below the target range where the Federal Reserve would be justified in raising interest rates. And even as overall unemployment rates have fallen to more acceptable levels, communities of color are still experiencing joblessness at rates far higher than their white counterparts, indicating a need for more targeted efforts to expand opportunity in these communities. The bottom line is that there is still weakness in the labor market which federal and state lawmakers would do well to address head-on. With interest rates still at record lows, it is an ideal time to invest in infrastructure—roads, bridges, and schools. Summer vacation may have started, but policymakers have more work to do.